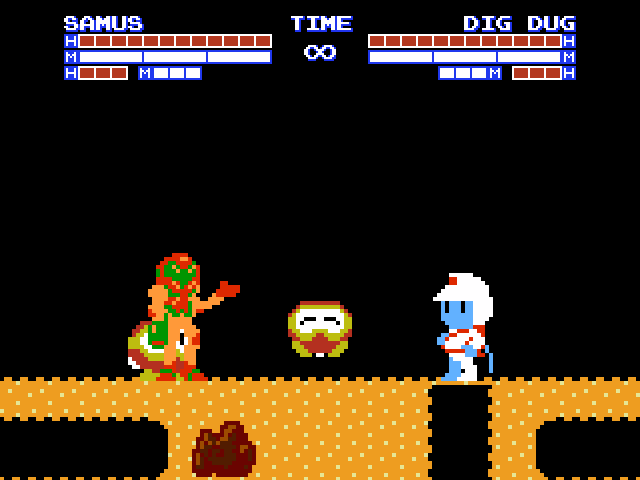 Ever since Super Mari War 5, I've been thinking about making an fighting game involving NES characters. Just a normal 2D fighting game like Street Fighter II, King of Fighters, etc. and none of this SSB bull crap. Only one character from any series (including unlicensed, yes that means I could include someone from the Cheetahmen) would be in it with a helper (or more then one for only certain characters) that can be summoned that is under the same publisher. (EX: Mario able to summon Luigi during battle. Urban Champion can summon Little Mac during battle.) I'm only sticking with JUST the NES/FC games themselves. No SNES, Genesis, any of the other consoles. (Maybe some of the accessories for the NES console such as R.O.B. and Zapper might be used). The only characters I won't include would be any ROM hacks (pirated or not; EX: Somari could be in but not Sonic from Sonic 3D Blast 5 due to Somari being the first one) and games based off of any media. (TV Shows, movies, etc. although references in moves can still be made. Characters who aren't based off of the media where the game was released elsewhere can be in though (EX: Spartan X, was released as Kung Fu in America which distanced itself from the movie). The engine I was planning on using is MUGEN 1.0 (the newer, better, much more stable one). I really don't like the idea of using Game Maker and I can't really start it from scratch. (If I knew C++, I would). For stages, they would use the original music and maybe the menu and select screens can use original music. (Although I prefer the music to be using an already existing sound engine such as Capcom, Konami, Hummer Team, etc. I prefer it be made with Famitracker and not any of the fake 8-bit crap). But I feel its just adding characters and stages to a MUGEN and changing the music files instead of brand new game. I do like the idea though. -If it goes live, will it include fan made content? Or will you add the characters yourself? -Non-NES characters can be allowed if their sprites are reduced to 8 bits? -What will happen if you manage to remake it for the C++ coding? -Do you have a limit for Characters, stages, modes, etc? That's all. I recommend making it as much balanced as possible in terms of memory consumption and load times. I'm only sticking with JUST the NES/FC games themselves. 3. ...well, it'll be using a more original engine of course. Maybe I can change the menu up a bit and such but other then that, the MUGEN engine pretty much covers a ton of stuff. 4. Well I do have a 48 character roster in mind (well, the playable characters) but when it does come to making it, I'll see where it'll go. Probably less or more. Stages will only be limited to the characters in the games. If you need any help just contact me, I'd be glad to help you out. ...damnit, cat's out of the bag now I guess. Ofcourse we would help you out! For stages, they would use the original music and maybe the menu and select screens can use original music. (Although I prefer the music to be using an already existing sound engine such as Capcom, Konami, Hummer Team, etc. I prefer it be made with Famitracker and not any of the fake 8-bit crap). Sorry if this is a very late notice and bump, but if you still need this I wouldn't mind helping! Or look in the megaman 72 forum! ...wow I just realized how badly worded that was. Let me fix that. For stages, they would use a track that originally came from one of their games (although there are exceptions which will probably be redone). All of the non-stage music will also be done from scratch as well. (Although I prefer the music to be using an already existing sound engine such as Capcom, Konami, Hummer Team, etc. I prefer it be made with Famitracker and not any of the fake 8-bit crap). But yeah, I still need someone who is good with music though so you can help if you want. Very nice work so far. Those animations seem very fluid. Project HQ, has latest build for testing, as well as information on different aspects of the game! I currently work as a spriter for the project, in case you all are wondering. I absolutely love the flag mario victory animation by the by, excited and anticipating to see the rest of the roster come to life! -Menu, character select and VS screen overhauls. -Samus has been added as well as her stage. -Power Charge sound has been changed. -Characters will flash during invincibility frames. -Knock back decreased on Fireball. -Raccoon Tail has an active frame and travels faster. -EX Racoon Tail should not be able to release a caught opponent. -Hammer Wreck juggles better and can destroy special projectiles. -Multistomp's command window is tighter if you try pressing A+B when the Stomp connects but you can hold A+B during Stomp's jump and if it hits, it'll activate. -Crouching Light Kick has a slightly larger hitbox. -Jumping Kicks have a slightly longer hitstun, Jumping Strong Kick has less knock back. -Quick Dash (Punch version) is invincible to projectiles and throws during the beginning of the move. -Quick Dash (Kick version) travels slightly less distance and shouldn't pass through opponents now. -Dash Punch can punch through special projectiles. -Power Launcher sends the opponent a little less higher up. -Power Charge gains a little less power. -Guard Attack has UC doing a high punch. -A 2nd dodge can be preformed by hitting back twice during Counter Attack. You can still do a projectile-invincible dash during the 2nd dodge. -Fixed a gltich with Scapegoat where UC would get hit during the super pause animation. -Sewer Brawl is invincible all the way if you land a successful punch and it juggles better. -Guard attack was changed into a hop kick. -Dagger Toss has more startup and recovery, dagger's knockback is less. -Whip Swing has increased startup and recovery. Can now hit Mario while crouching, can bypass Mega Man's Star Crash and can hit projectiles properly. Hitting with the tip of the whip can knock an opponent down and do more damage. -Holy River now only spawns 4 flames but can be canceled from Dagger Toss. -Kid Dracula throws out two fireballs and his crouch summon attack has less startup. -Crouching Strong Punch now launches opponents into the air. -Startup increased in normal Mega Buster, shots do less knockback. 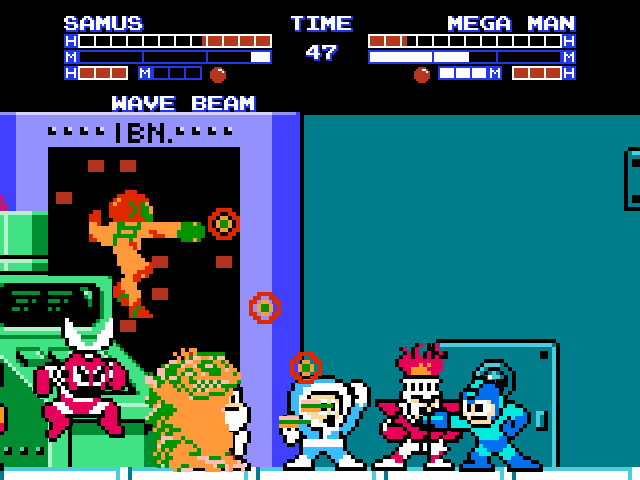 -Can't use Mega Buster when the Star Crash projectile is on screen and vice versa. -Startup decreased on Star Crash but the stars themselves can be destroyed by super projectiles before being fired. -Protoman shoots 3 bullets per jump in the stand summon. During his crouch summon's entrance, he automatically appears.